​The history of wars is always interesting, but I think the American Revolutionary War is particularly thrilling. I am referring to the things that happen before a war, the catalysts, the events that lead to the blowup, the sudden violence. For the American War of Independence, the catalyst incident is the famous Boston Tea Party. Without the Boston Tea Party, there might not have been an American Revolution. To share my fascination with you, I have prepared a detailed account of the events that led to the Boston Tea Party and the events afterward which precipitated the American War of Independence. Trouble had been brewing in the Thirteen Colonies from 1765. The Boston Tea Party was merely the inevitable eruption caused by the winds of the revolution that had been simmering. The immediate cause of the protest was the Tea Act, which allowed the British East India Company to directly ship its tea to the British colonies of North America without paying any taxes. Disguising themselves as Native Americans, the demonstrators boarded ships that were bringing East India Company tea into Boston Harbor and destroyed the entire shipment. The phrase “Boston Tea Party” came later. In the aftermath of the event, people referred to it as “the Destruction of Tea at Boston Harbor” or more concisely: “the Destruction of the Tea”. To understand what caused the Boston Tea Party, you must understand the American Revolution. The Boston Tea Party and the War of Independence after it are merely the high points of something that had been brewing for years. Protest and war never emerge out of a vacuum. The political upheaval we today call the American Revolution began not in 1773 when the men in Mohawk costumes destroyed British East India Company tea, but in 1765. The revolution did not end until 1783 after the end of the war and the signing of the Treaty of Paris. We must back up a little to 1763. This was when the French and Indian War ended. This war was the North American theater of a global war known as the Seven Years’ War which played out between 1754 and 1763. The French and Indian War involved fighting between the colonies of British America and the colonies of New France. Their parent countries, Great Britain and France, supported them, and both sides had their American Indian Allies. The Seven Years’ War was a world war in every sense of the world. Five continents were involved: it occurred in Europe, the Americas, West-Africa, India, and the Philippines. It involved two European coalitions, with Britain-Prussia and allies on one side and France-Austria and allies on the other. It was this war that determined the shape of world affairs in the coming years. The balance of power in Europe shifted, and this was the beginning of the British world supremacy of the nineteenth century. And it led to two revolutions: the French Revolution and the American Revolutionary War. It is this war’s American theater of operations that came to be known as the French and Indian War. The French colonies were outnumbered: at 60,000 settlers to the British colonies’ two million. But more Indian groups were on their side than the British side. For that reason, the British colonists called it the French and Indian War. The Seven Years’ War caused Great Britain’s National debt to nearly double. The Crown had to find new sources of revenue to help pay off the debt. And one way was by imposing new taxes on its colonies. The English Parliament passed the Currency Act in 1764, a law which was supposed to regulate paper money issued by its American colonies. The Act prohibited the use of paper money in the payment of debts, whether public or private. My friends from SpeakerChamipon helped me about knowing the currency act, check out their best 6x9 speakers reviews on their website. The intention of the Act was to protect British Merchants from receiving payment in depreciated colony currency. The merchants felt that paper money was being used as a means to evade debt payments. Other acts passed during this period include the Sugar Act, the Quartering Acts, the Stamp Act 1765, and the Declaratory Act. The unintended consequence of the passing of the acts and the taxation was to sow the seeds of rebellion that would culminate in the frustration vented in the Boston Tea Party and the eventual violence meted out in the American War of Independence. The issue of taxation in the colonies was a contentious one. Since 1660, the English Parliament had been in control of colonial trade and the taxation of imported and exported goods. In 1689, England passed the Bill of Rights, an act of parliament that set out basic civil rights and constitutional matters. The act set out a list of rights and liberties. And one of these stated that “levying taxes without grant of Parliament is illegal”. It was this tenet of the Bill of Rights that the rebelling colonists clung to in voicing their discontent. Since they were not represented in the English Parliament, they pointed out, the taxes imposed on them were in clear violation of the guaranteed Rights of Englishmen. Parliament tried to placate the colonists by telling them that they instead had virtual representation. According to this concept, all members of Parliament reserved the right to speak for the interests of all British subjects, not just those of the particular districts that had elected them. The colonies did not favor this concept and rejected it. “No taxation without representation” became a potent slogan and rallying call that gave the colonists their resolve, culminating in the Boston Tea Party and the Revolutionary War afterward. One politician of the period, James Otis Jr, is famous for coining the catchphrase “Taxation without representation is tyranny”. The immediate cause of the Boston Tea Party is the Tea Act of 1773. The act was passed on 10th May. The Boston Tea Party occurred months later on December 16th of the same year. First, let me tell you about the British East India Company. Due to stagnation of commerce and trade in Europe at the time, the East India Company was in financial straits. In a bid to avoid bankruptcy, the company appealed to the English Parliament for help. The help came in the form of the Tea Act of 1773. Thanks to the act, the company had significant autonomy to trade in the American colonies – it was exempted from tea import duties which its colonial competitors were required to pay. It also exempted the company from having to pay export duty when shipping tea out of Britain. Naturally, this did not please the colonists. The company’s London warehouses held a massive amount of tea, and the company was struggling to survive. The Tea Act would enable the company to get rid of their stock. On the other hand, it would enable the government to undercut the prices of smuggled tea coming into the North American colonies. The rebellion began with a coalition of merchants, smugglers, and artisans who banded together in opposition of this turn of events. They harassed the company’s authorized consignees and made successful attempts in some colonies to prevent the tea from being brought to shore. One of these colonies was Massachusetts. 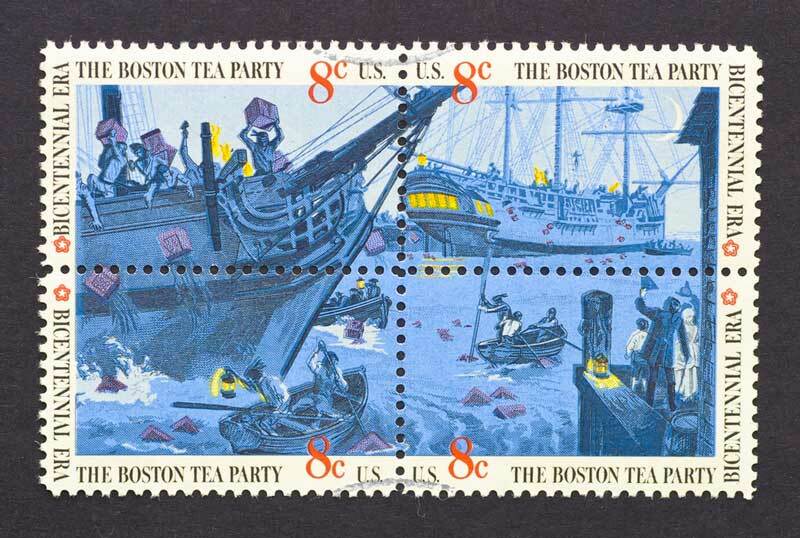 It was the famous Destruction of Tea at Boston Harbor: the Boston Tea Party. The main person behind the Boston Tea Party was a political writer who was also a tax collector and a fire warden. This man was Samuel Adams, one of the Founding Fathers of the United States and cousin to John Adams the second President of the United States (not to be confused with John Quincy Adams the sixth President). He was also one of the leaders of the Sons of Liberty. Samuel Adams is the most visible among the leaders of the movement that opposed Parliament’s taxation efforts in the colonies. As a leader of the Sons of Liberty, he was directly involved in the activities that led to the Boston Tea Party. On November 29, 1773, after a tea ship known as the Dartmouth came to Boston Harbor, Samuel Adams organized a mass meeting attended by thousands at the Faneuil Hall in Boston. The people were so numerous that the meeting had to move to the Old South Meeting House, which was larger. At this meeting, it was decided that the captain of the Dartmouth would send the ship back without the import duties required by British law. They also decided to assign 25 men to watch the ship and prevent unloading of the tea. But Thomas Hutchinson the Governor of Massachusetts Bay would not allow the Dartmouth to leave Boston Harbor without paying the import duty. Meanwhile, two more ships, the Beaver and the Eleanor arrived. I got this information from Kevin, he wrote about best citrus juicers, check it out if you are interested. December 16th was the Dartmouth’s deadline. 7,000 people came together at the Old South Meeting House. Since the governor had barred the ships from leaving, Adams made his declaration: “This meeting can do nothing further to save the country”. Later, it became a popular narrative that this statement was a signal for the Boston Tea Party to begin. But the claim has never been substantiated. People began to leave the meeting, but Adams tried to stop them since the meeting was not yet over. It is these people who walked out of that meeting in the Old South Meeting House of Boston, Massachusetts that went on to don Mohawk costumes (to disguise themselves since what they intended to do was illegal) and carried out the Destruction of the Tea. It was later in the evening that a group of 30 to 130 men came aboard the three tea ships and spent the next three hours dumping 342 chests of tea into the water. Did Samuel Adams plan the Boston Tea Party? No one can say for sure. However, after the event occurred, he came out publicly to defend it. He justified it with the argument that this was not a lawless mob; rather, it was a group of principled protestors who had been forced to take action in the only way left to them to defend their constitutional rights as citizens. Another famous leader associated with the Boston Tea Party is Paul Revere. Paul Revere was a silversmith, industrialist, and a Patriot. He was one of the ringleaders of the Boston Tea Party. Revere’s finest hour, however, comes less than two years later on April 7, 1775, when he rode from Boston to alert the colonial militia of approaching British forces before the battles of Lexington and Concord. Also well known for his role in the Boston Tea Party is William Molineux, a hardware merchant. Among the top Whig organizers of the protest, he was the only one who didn’t attend the meeting at the Old South Meeting House. It is assumed that he was at the dock observing the Destruction of Tea at Boston Harbor. The Boston Tea Party was the catalyst that ultimately led to the American War which began less than two years later on April 19th, 1775. The English government took it as an act of rebellion and retaliated by escalating. It was the escalation after the Destruction of Tea at Boston Harbor that caused the colonists to take up arms and fight the British. The Boston Port Act resulted in the closure of Boston’s port until payment by the colonists of the destroyed tea and until the king was satisfied that order had returned. According to the colonists, this was an unfair act, since it punished all of Boston for the sins of a few. A barricade was set up on the Port of Boston. As a result, no ship could land on the port; nor could any ship load or unload its cargo. Only after restitution had been made to the King’s treasury for the customs duty lost and to the East India Company for damages suffered would the port be reopened. The Act also directed that the seat of government in Massachusetts should move from Boston to Salem. The port of entry into the colony would no longer be Boston but Marblehead. The act was enforced by Royal Navy warships that patrolled the mouth of Boston Harbor. The British Army also helped enforce the blockading, and so Boston was filled with troops. The act angered all Bostonian citizens, whether Loyalist or Patriot, and they sought assistance from the other colonies. This they received from sympathetic colonies in the form of relief supplies. The act took effect on June 1st, 1774. That day, flags flew at half-mast – it was widely observed as a day of fasting and prayer. It was this unity that birthed the spirit that led to the unification of the Thirteen Colonies of America. They now had one cause that brought them together: one adversary. This section was contributed by Adam, he talks about guitars in his blog Guitar ﻿﻿﻿﻿H﻿﻿eroe﻿s. It was the Massachusetts Government Act of 20th May 1774 that unilaterally eliminated the Massachusetts’ charter, effectively bringing the colony under British government control. Henceforth, nearly all positions in the colonial government would be appointed by the Governor, Parliament, or the king. It also limited town meetings to one a year unless it was the governor who’d called for it. The British justified the act by pointing out that the main reason the Boston Tea Party had occurred in the first place was because of Massachusetts’ highly independent local government. Previously, Massachusetts was unique among the other colonies because it had the ability to elect the members of its executive councils. The English Parliament was determined to take way power from Massachusetts’ democratic part of a government, thus ensuring control remained with Britain. The historic rights to self-government were abrogated and power in the colony centralized in the royal governor’s hand. According to the Administration of Justice Act, the Royal governor had the right to order that trials of accused royal officials be held in Great Britain or anywhere else within the British Empire should he decide that the defendant could not receive a fair trial in Massachusetts. The act stated that any witnesses who had to travel would receive reimbursement for the travel expenses. However, they would not receive any reimbursement for the earnings they would lose during the period of the trial. According to George Washington who would later become the First President of the United States, this was a “Murder Act”. Since few could afford to forego their wages in the interest of testifying abroad, justice would not be served for Americans harassed by British officials. There are two Quartering Acts: the Quartering Act of 1765 and the Quartering Act of 1774. Both acts had the intention of providing British troops with housing and accommodation within the colonies. The first Quartering Act declared that Great Britain would house its troops in American barracks and public houses. But if there were more soldiers than the barracks and public houses could handle, then they would be quartered in inns, livery stables, ale houses, outhouses, barns, and so forth. The colonial authorities would pay for the cost of housing and feeding the soldiers. The Quartering Act of 1774, however, was a different matter. It was one of the Coercive Acts passed by the English Parliament in response to the events of 16th December 1773 on Boston Harbor. According to many sources, it allowed British soldiers to live and eat in colonial homes without asking for permission from the owner of the home or establishment. However, historian David Ammerman contends that this is a myth, that the act did not allow troops to come into people’s homes but rather into unoccupied buildings. This Act did not draw as much ire and protestation from the colonists as the other three Coercive Acts. On September 5 to October 26, 1774, delegates from twelve of the Thirteen Colonies met in the Carpenter’s Hall in Philadelphia. This was the First Continental Congress. The Americans had called it as a response to the Coercive Acts – or as they called them, the Intolerable Acts. 56 delegates from all but one of the 13 Colonies were in attendance. Only Georgia failed to send any delegates – being at the frontier of the colonies, Georgia had many problems dealing with Native Americans and hoped to receive assistance from the British toward that end. Two attitudes were prevalent among the delegates of the First Continental Congress. On the one hand, the conservatives wanted to focus on creating common policies that would apply pressure on Parliament to rescind the Coercive Acts. On the other hand, the Radicals wanted to develop a decisive statement of the Colonies’ rights and liberties. They wanted an end to what they considered Parliament’s abuses and to retain the constitutional rights guaranteed by the English constitution and the colonial charters. It was the Conservatives who won. The First Continental Congress did not call for independence. Instead, it listed a colonial bill of rights and a detailed list of grievances in a statement called the Declaration of Colonial Rights or the Declaration and Resolves of the First Continental Congress. They decided to boycott British goods with effect on December 1774. As a result of this boycott, there was a 97% drop in imports from Britain in 1775. Though the boycott was a success, the American Revolutionary War broke out before it could have an impact on British colonial policy. The First Continental Congress also provided for a Second Continental Congress that would meet on May 10, 1775. This particular section was contributed by Dan, check out his Pro Fitness Guide. This time, all the Thirteen Colonies, were represented. As had been decided, the Second Continental Congress met beginning May 1, 1776. This second Congress managed the war effort, disbanding in 1781 to be replaced by the First Confederation Congress (there would be a total of ten Confederation Congresses before the First United States Congress). On July 4, 1776, the Second Continental Congress adopted the United States Declaration of Independence. By this time, the war had broken out, beginning on April 19, 1775, when Massachusetts militia at Lennox and Concord met British forces in open battle. While formerly the 13 Colonies had regarded themselves as independent sovereign states after they began their war against the Kingdom of Great Britain, the Declaration of Independence forged a new nation: the United States of America. Up to this day, July 4th is celebrated as America’s Independence Day. In response to the Massachusetts Government Act and the Boston Port Act as well as the other Coercive Acts, colonists from Massachusetts made the Suffolk Resolves. This was a declaration made in Massachusetts’ Suffolk County on September 9, 1774. They resolved to boycott British imported goods, a stand that was reiterated by the First Continental Congress on September 17, 1774. The Massachusetts colonists also made a shadow government. A few days after the meeting of the Suffolk Resolves, the 12 delegates met in Philadelphia in the First Continental Congress. The war broke out on April 19, 1775. On this day, 700 British soldiers marched into Lexington to capture Patriot leaders Samuel Adams and John Hancock and to seize a Patriot arsenal. Unknown to them, the Patriots were waiting. When they learned that the British were marching against them, Paul Revere and William Dawes set out to warn the militiamen. When the British got to Lennox, Paul Revere, Samuel Adams, and John Hancock had fled to Philadelphia. 77 armed militiamen awaited the 700 British troops. The Battle of Lexington was brief - minutes. Eight American soldiers were dead, and ten were wounded. One British soldier was injured. The first battle of the American Revolutionary War. But the fighting was not over. The British troops marched into Lennox at approximately 5 a.m. After being routed by the British, the Patriots sent out calls to arms across Massachusetts. Two hours later (at approximately 7 a.m.), the British troops arrived at Concord. This time they were not as fortunate. Hundreds of armed Patriots awaited hem. The two sides began to fire at each other. The British troops beat a hasty retreat to Boston, with Patriot marksmen shooting at them from behind walls, rocks, and trees. At Lexington, the militiamen they had routed earlier were waiting to deliver their revenge, and they killed several British soldiers. Feetstrap helped me with this part of the article. When they finally arrived at Boston, almost 300 of the British soldiers had either been killed, wounded, or missing in action. Patriot casualties did not exceed 100. The Battles of Lexington and Concord were the first battles of the American War of Independence. The Boston Tea Party occurred due to the frustration of the American colonists. Had there been any legal alternative, the Boston Tea Party would not have happened. The men who carried out the destructive work of the Tea Party were not hooligans. They were simply men who had been pushed to the wall by what they considered an unjust government. Lacking a legal alternative, they resorted to the act known as the Destruction of Tea at Boston Harbor. Later, when there was nothing else they could do to get justice, they would resort to violence, and that would be the American War of Independence. The Boston Tea Party is not a single event that happened in a vacuum. There is a history to it: things that happened before and things that happened after. Let’s start by looking at things that happened before. The British government was in control of the 13 Colonies of America. The relationship between the Government and its colonial subjects was uneasy. Wars have a way of changing history, of making big things happen, and that is what happened in the history of the United States. The War of Independence might never have happened if it weren’t for a previous war: the French and Indian War. The French and Indian War was part of a bigger war known as the Seven Years’ War. This is a war that had the global scale of a world war. It broke out in Europe, with Britain and Prussia on one side while France, Austria, and the Holy Roman Empire were on the other. In North America, the French settlers battled with the British settlers. Most of the Indian tribes were in support of the French settlers. For that reason, the British named the war after their opponents: “the French and Indian War”. The Seven Years’ War had begun in 1754 and ended in 1763. Though Britain won the war, it was left with a massive national debt which it had to pay off somehow. Consequently, the English Parliament began to pass taxation laws in the colonies that the Americans did not like. The Americans argued that these taxes were unconstitutional. They argued that for them to be taxed, they had to be represented in Parliament. It was a right, they argued, enshrined in the Bill of Rights. They took up the slogan of “no taxation without representation”. But it was the Tea Act of 1773 that truly caused matters to escalate to dangerous levels. Citing what they deemed injustice treatment of the colonies’ merchants while the East Indian Company got preferential treatment, a movement known as the Sons of Liberty began to organize meetings to discuss a course of action. It was after one of these meetings that some members of the Sons of Liberty wore American Indian disguises and boarded the three ships on Boston Harbor that contained East India Company tea which they dumped overboard. In retaliation, the English Parliament passed the Coercive Acts of 1774. This was the worst thing they could have done. It only served to escalate matters further. Calling them Intolerable Acts, 12 of the 13 States met in what became known as the First Continental Congress. In Massachusetts, the colony most affected by the Coercive Acts, militiamen were training in readiness for war if it came to that. On April 19, 1775, they received their wish. A troop of British soldiers marched to the town of Lennox to capture Patriot Leaders Samuel Adams and John Hancock. Paul Revere rode out to warn them. He, Adams and Hancock then escaped to Philadelphia while the militiamen awaited the British. When the British arrived, they had an altercation with the militiamen and easily won. Check out best cooling pillow on Veronica's blog. She has a buying guide for that too. They marched on to Concord where more men from the Massachusetts countryside had gathered. They fought another battle. Afterward, they retreated, with militiamen harassing them all along the way. More British soldiers fell than did Patriots. This was the famous Battle of Lennox and Concord, and the American War of Independence had officially begun. Check Plasmacutteradvisor for more detailed information about this. It is tempting to read history and wonder, “what if such and such a thing had not happened? Would the American Revolutionary War still have happened?” What if there was no Seven Years’ War? What if the British Government had not decided to favor the East India Company? What if Parliament had allowed the colonies to have representatives? What if the governor of Massachusetts had allowed the captains of the ships to leave without paying import duty with all the tea still intact? What if the British government had chosen the path of dialogue rather than passing the Coercive Acts? The fascinating thing about this war is that so many things had to go wrong first. At every step of the way, you can see where things could have been done differently. But in the end, it seems that when history wants to happen in a particular way, nothing can stop it. Reading about the Boston Tea Party and the American Revolutionary War today, it seems to me that they were as inevitable as the dawn.